The invention of Rock n’ Roll has no definite founder. We all know that Elvis was the King of Rock n’Roll, but others such as Bill Haley and Little Richard also form the foundation of Rock n’Roll. The original lyrics were so racy that they had to be rewritten. Dorothy La Bostrie was an aspiring songwriter and was summoned to the Dew Drop Inn to rewrite the lyrics. Before lunch was over, the lyrics had been rewritten and were ready for performance. 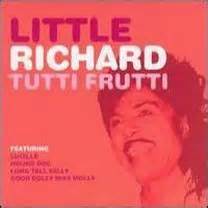 In the last fifteen minutes of that recording session, “Tutti Frutti” was recorded. Upon release, the song reached No. 17 on the Billboard Music Charts.